1Research Scholar, Bharathiar University Coimbatore, Tamil Nadu, INDIA. 2Associate professor, PG and Research Centre, St.Joseph’s College Bangalore University, Karnataka INDIA. 2Head of the Department and Associate professor, PG and Research Centre, Karnataka St.Joseph’s College Bangalore University, INDIA. Background: Thespesia populnea L. commonly known as tulip tree or ‘portia’ tree has been traditionally used for different illnesses. Thespesia populnea L. is considered to have high tannin content and have high therapeutic value. Purpose: The antifungal and antibacterial potential of T. populnea L. should be checked on multiple drug resistant opportunistic pathogens Pseudomonas aeruginosa and Candida albicans in HIV/AIDS patients. Methods: In order to check the effect of antibiotics antibiogram was studied with antibiotic sensitivity discs. To study the major factor affecting resistance test on formation of biofilm was done by tube and plate methods. The dried flower powder was subjected to sauxlaut hot extraction and the crude extract was analysed by Gas Chromatography and Mass Spectrophotoscopy. 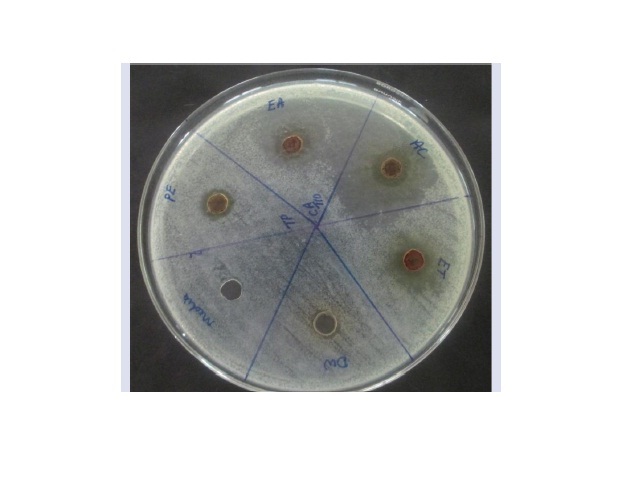 Antimicrobial potential of the ethyl acetate extract of the flower was checked by well agar diffusion, UV Spectrometry for growth rate and docking of selected compounds on the microbes of our study by the application of a software. Results: The tested extracts and the selected compounds have showed significant results in the antimicrobial activities against the opportunistic pathogens in human. Higher the concentration of the extracts better is the inhibition of microbes. Conclusion: The study provides a scientific rationale for the traditional use in the management of opportunistic pathogens which are multidrug resistant. Varghese J, Rajamani S., Daniel B. Antimicrobial Potential of Crude Extracts of Thespesia populnea L. Flower on Multiple Drug Resistant Opportunistic Pathogens in HIV/AIDS. Pharmacognosy Journal. 2018;10(3):590-597.